While you can't prevent disasters, you can prepare for them. Read on for 3 reasons you should invest in IT disaster recovery. IT disaster recovery lets an organization to maintain or resume critical functions after a disaster. Disaster recovery is part of business continuity. In our modern business world, IT systems are a critical component of most business operations. So disaster recovery is a huge component of a business continuity plan. Disaster recovery allows businesses to have a plan for when negative events strike. Here are three main benefits of disaster recovery. Clients, no matter in what industry, expect reliability from their business partners. If a business fails to meet a customer's expectations, clients are likely to switch to a different service provider. Losing just one customer costs an organization a lot. IT disasters and downtime in your company can significantly impact customers. Especially for B2B service providers. Having a disaster recovery plan in place allows businesses to keep their reputation intact, no matter what happens. A disaster recovery plan also means that your customers have confidence that you are prepared for negative outcomes. This is a big step in customer loyalty and retention. Another crucial reason why disaster recovery is vital to your business has to do with the bottom line. When you have both a virtual and physical environment, you are safe from ransomware. Ransomware attacks cost small companies over $100,000 per ransomware incident due to downtime. One out of every six businesses affected with ransomware suffered over 25 hours of downtime. With data recovery, you won't have to pay the ransom to get your systems back. With a virtual environment, you can restore a clean version of your systems. And you'll do it without padding the pockets of cybercriminals. Disaster recovery plans also help you reduce your revenue losses in other areas. You will get your systems up and running sooner which saves you revenue. And you reduce downtime costs related to and management and technical assistance. You already read about the cost of an hour of downtime. And you understand the impact IT disasters can have on your customers. IT disaster recovery is crucial to keep your business running smoothly. Disaster recovery companies can keep your critical processes keep running. Interruptions can be minimized and you'll be able to resume operations quickly. IT disaster recovery is a necessary business expense that should be part of every operation's yearly budget. 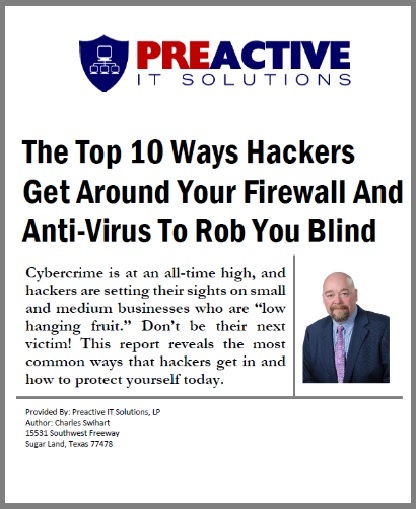 Not only does it protect you against further revenue loss due to ransomware and downtime, but it also protects your reputation. Before you go, get a copy of our free book, "The IT Buyer’s Guide: What Every Business Owner Must Know About IT Support Services And Fees."